Our stunning and gracefully elegant asymmetrical arrangement of roses, Stargazer lilies, Matsumoto asters and more in shades of red and pink will provide a reflection of your sympathy and hope. 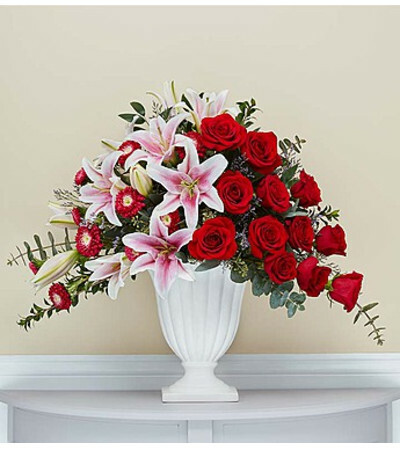 Clusters of vibrant fresh blooms are displayed in a graceful keepsake pedestal vase. Elegantly crafted with satin finish and delicate fluting, a timeless vase that can be used to hold flowers or on its own as an objet d’art. Very impressed with the floral arrangement that was made for my daughter. I am in Michigan and I did an online order! I am a very happy customer. I went to the location on Barker Cypress near Hwy 290. Amazing service and great selection. They stay fulling stocked with some of the freshest and ready to go arrangements. I think i found a new florist. I ordered the Designer's Choice for a friend's birthday and she had one word to describe it when delivered. Gorgeous!